In our most recent book club episode we discussed the fabulous Star Trek: Legacies trilogy which follows the character of Number One as she attempts to rescue crew mates stranded in another dimension. Now we’re excited to bring you an interview with authors of all three books in the series. Huge thanks to Greg Cox, David Mack and Dayton Ward for taking the time to answer our questions. W@W: How was the idea for this series generated? Why was it important to make Number One such a central character? 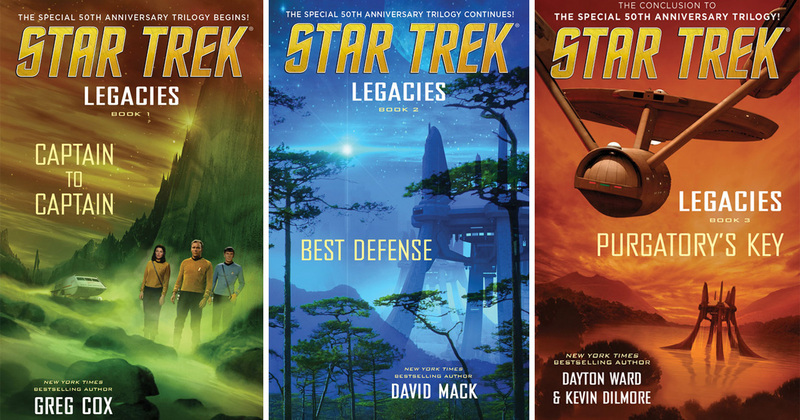 David Mack: It all started with me and Dayton Ward talking a few years ago, in 2014, about the fact that we had not yet heard of any big novels planned for the 50th anniversary of Star Trek in 2016. We knew something would likely be planned, and we figured if we were proactive and pitched an idea to the editors, that would improve the odds of our being involved with the golden anniversary project. Once we had our dream team together, we started throwing ideas around. The trick was coming up with something that felt true to the original series of Star Trek, that also felt suitably “epic” enough to justify being a trilogy. We went through a number of ideas before we settled upon the narrative that became Legacies. The focus upon Una — aka “Number One” from the original Star Trek pilot “The Cage” — arose from our desire to tell a story that would span much of the original series. Because we couldn’t effectively use Pike himself as the link between the books, Una was the next logical choice. She’s also been a favorite character of Greg’s, mine, and also Dayton’s and Kevin’s, so the idea of making her the trilogy’s linchpin character proved irresistible. Dayton Ward: This also allowed us to have another strong female character in the mix without having to invent one just for the trilogy. Once we settled on that, it became apparent how she would factor so heavily into all three books. W@W: How did you work with the other authors to craft the story arc for the series? How is it decided who writes which part of the story? Greg Cox: Lots and lots of emails, flying back and forth between three different states, as we tried to hammer out a rough outline for the entire trilogy, while leaving room for each of us to flesh things out as needed. As I recall, and understand that this was two years and several books ago so my memory is a little hazy, I volunteered to write the first one since I sneakily thought that would be easiest; I could just get the ball rolling and let the other guys figure out what happens next! But, of course, it turned out that I had to work extra hard to make sure that everything was set up just right, so that Dave and Dayton and Kevin could tell their own stories the way they planned. True story: at one point, Dayton and Kevin came up a neat idea for Book Three that meant I would have to go back and rewrite part of Book One to set it up. But it was a neat idea so . . . time to rework that chapter. David Mack: It was mostly the product of a plethora of e-mails, a handful of Skype calls, and a few marathon gab sessions. I’m not entirely sure how we first thought to divide up the writing duties. But once we settled on a story that involved the early years of the Enterprise, that felt like a natural fit for Greg. The middle chapter, which we wanted to focus on the Federation-Klingon negotiations being undermined by Romulan agitators, felt like my wheelhouse. And that left Dayton and Kevin holding the mop to perform the Herculean labor of narrative cleanup in book three. W@W: Number One’s name has changed a few times in the books. How was Una settled upon for these books and how do you feel about her nickname and its backstory? Greg Cox: I realized early on that there was no way to reconcile the various different names and backstories Number One has had in previous novels and comics, so we mostly just took what we wanted and ignored the rest. And we definitely needed to give her a name if we were going to write three books about at her, featuring the character at various stages in her life. (I’d managed to duck the issue in Child of Two Worlds, but wasn’t going to be able to do it again when writing about her early years in Starfleet before she became Pike’s first officer.) I believe Dave Mack came up with the name “Una,” which all we liked, and her backstory was basically a composite version of what various other novels had revealed about her before. We liked the idea that she was a prodigy and over-achiever and had always been “Number One” in whatever she attempted. David Mack: We also liked the idea of naming her “Una” as a nod to our friend and fellow Star Trek author Una McCormack. Dayton Ward: Things like this shift all the time in tie-in fiction. I think the Romulan commanders from “Balance of Terror” and “The Enterprise Incident” have something like seventeen different names across the decades. I figure someone else somewhere down the line will give Number One another new name. Or, maybe she’ll show up on Star Trek: Discovery and they’ll give her a name there. Who knows? W@W: What part was the most fun for you to write? Greg Cox: I really enjoyed writing the young Lieutenant Una flashbacks, to the extent that I was actually a little worried about how big a role she ended up playing in the first book. Fortunately, I knew that Kirk and Spock and McCoy and the rest of the classic TOS crew had lots of good stuff coming up in the next two novels, so that even if Book One was a little Una-heavy, it would all even out over the course of the trilogy. Dayton Ward: For original series stories, I always like scenes between Kirk, Spock, and McCoy. That was true here, as well. Also, there are scenes with Spock and Chekov, or Chekov and Uhura, where we got to break them away from their regular roles and really show them contributing to solving the various problems over the course of the story. You can never really introduce anything too radical in books like these, but it’s still fun when you’re able to add some new bit of backstory or dimension to characters as well-known as the various Star Trek crews. And as silly as it might sound, one of my very favorite things about this particular book was the last couple of pages, where Kirk’s reflecting on the mission they’ve just completed and what missions might lay ahead, and I was able to connect that to the original series opening narration as a way to close out the book. Eighteen years I’d been writing Star Trek stories at that point, and that was the first time I’d gotten to do that. Is this job weird, or what? W@W : Can you tell us about how you settled on pronouns for the gender-less Jatohr? For example, the books use “hir” for the possessive pronoun, but “s/he” instead of “sie” or “ze” for the subject pronoun. We were curious about the process for deciding this. Greg Cox: That was my call, pretty much. After doing a little research on gender-free pronouns in Star Trek novels, I discovered that “s/he” was what had been used in previous Trek novels, by authors such as Peter David and Margaret Bonanno, so I figured I’d stick with that precedent. W@W: How do you see Joanna McCoy as a character and what was it like to write her? David Mack: I see her (in this story’s time period) as a young woman still looking for her path in life, and beginning to test the bounds of her strength and ability. Some of her decisions were driven by resentments toward her father that stem from their years of estrangement. I enjoyed letting her subvert some expectations by partly freeing herself from a hostage situation, and emphasizing her dedication to her work as a medical professional, even at risk to her own life, during the story’s climactic battle. W@W: We all really enjoyed the part of Purgatory’s Key where Sarek and Una are uniting the minds of their crewmates in the real Jatohr reality. How much input did you have into the fact that the first reality they arrived in was an illusion? And what went into describing the Jatohr’s metaphysical plane of existence? Thanks again to Greg Cox, David Mack and Dayton Ward for taking the time to answer our questions about Legacies! Pingback: David Mack | Talking Trek with Women at Warp, and more!